Today I can confirm that the proposal to sack our only two welfare rights advisors has been suspended. I will be going in to talks with our members next week. I want to thank all the council workers who have sent messages of support including solidarity messages from the community and of course BAFTA winner Ken Loach and Ian Hodson President National President Bakers and Allied Food Workers Union BFAWU. The lesson must be if you don’t challenge decisions then you will never know if you could have made a difference. I am proud of the “Barnet Two” who despite the incredible stress and pressure they are under have managed to stay positive and focussed. I can see why both of them are excellent Welfare Advisors and why they are a credit to the Council. These are the words Ken Loach uses to describe the proposed cuts to our last 2 Welfare Rights Advisors. Shockingly this proposed cut is not about saving money! One of the biggest user groups of the service are those with Mental Health problems. Of course it’s great that famous people are joining in to break the taboo of talking about Mental ill-health but what is the point if we just then kick these people in the face by removing access to an important service! Please join us in Hendon Town Hall on this historic occasion of watching an in-house model being proposed to our local councillors. As a result of consultation we have now learnt that the two welfare rights advisor workers are not being sacked in order to make CUTS, they are being sacked because vulnerable families will get a better service without them! This scene shows the daily humiliating life experiences people in need are facing. I’m referring to this scene, because the Barnet Council proposal is to move away from helping to sign posting. It sounds good in the highly paid consultancy circle world. 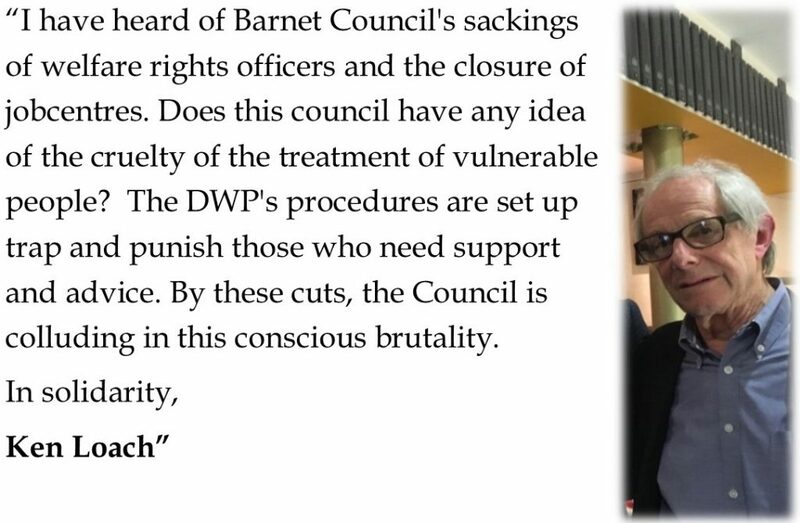 BUT the grim reality this is not just a cut for two workers it is a cruel cut that will deny access to the vital information, advocacy and support for the most vulnerable families in Barnet. Before Barnet UNISON found out that this was NOT a financial saving, we would have referred the Council back to the uncontrollable Agency/consultancy worker costs which have gone from a round £7.3 million in 2012 to 19.8 million by March 2017. In the past seven years there have been many changes in the way Advice in the London Borough of Barnet has been delivered. The following organisations have either closed down or no longer do Welfare Rights Advice. CAB also used to operate a home visiting service which has also ceased. 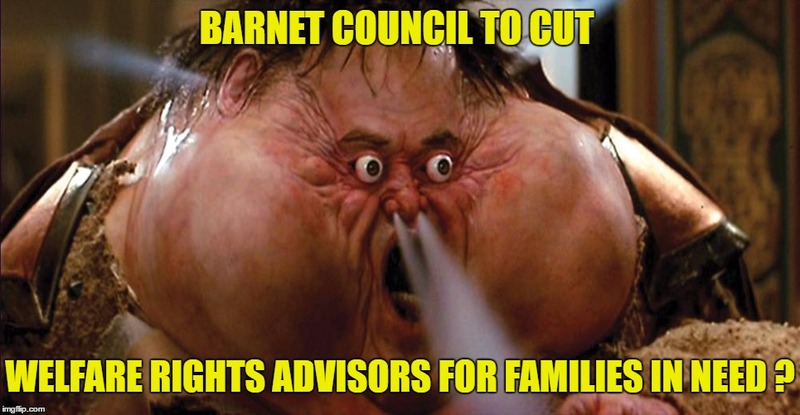 The two Welfare Rights workers are the only service that still provides comprehensive/ impartial benefits Advice up to Appeals level in Barnet. Both statutory and non-statutory organisations refer to the two workers. 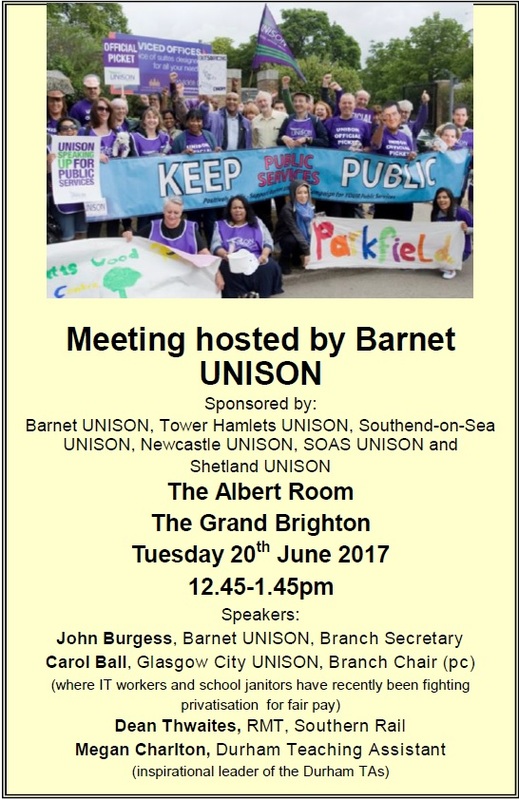 In consultation it has been put to Barnet UNISON that the service could be picked up by other organisations. What is clear is that the report does not appear to know what is being provided out there in our community. Below are some of the organisation mentioned who could pick up the work left as a result of sacking the two welfare rights workers. DWP is unable to help the majority of our clients as there may be a conflict of interest. We support client in taking cases to the Tribunal against DWP. There would be a conflict of interest, should the DWP provide welfare benefits advice. Welfare Benefit Advice exists to ensure that clients are made aware of their legal rights and represented in the event of disputes and maladministration of benefits. 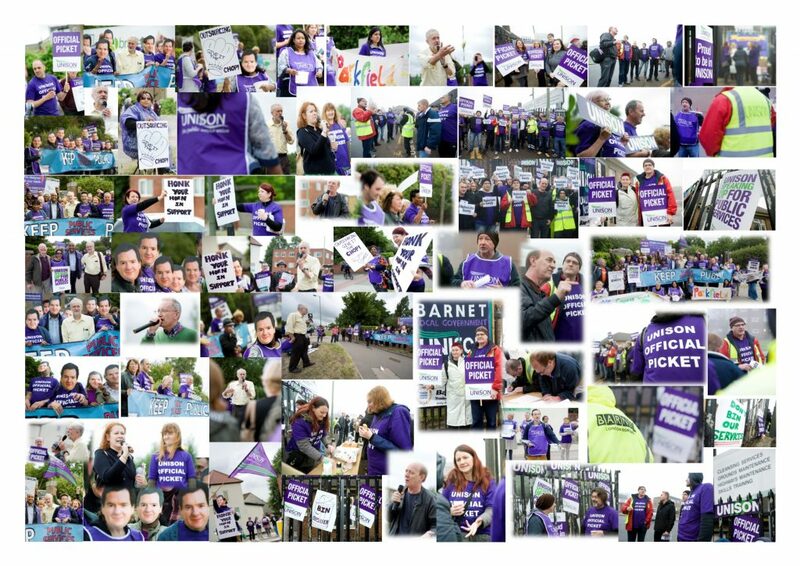 Barnet UNISON on Tuesday 9 May at the Family Services JNCC declared a ‘failure to agree’ in response to the proposed sacking of the two welfare rights workers. The matter has now been escalated to a meeting chaired by the Chief Executive. If the proposal to sack the workers is not withdrawn the matter will be raised at General Functions Committee on 28 June where we will address the Leader of the Council. “I am so proud of our branch who have effectively been working round the clock for the last 9 years and to finally have discovered the antidote to this vicious and harmful virus will bring hope to others. 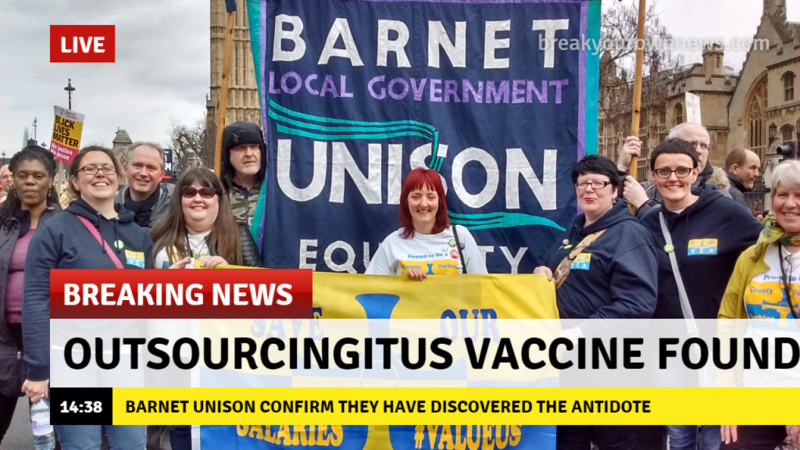 I know from bitter personal experience that “outsourcingitus” is very contagious and damaging to the health and wellbeing of members and to the services this virus feeds off. As many know we had a serious outbreak between 2012- 2014 where a large number of staff were affected as were residents. We intensified our efforts and at one point the branch nearly disappeared completely, incredibly we are still here despite all the odds; which I believe is all down to the dedicated and hardworking Unison reps. 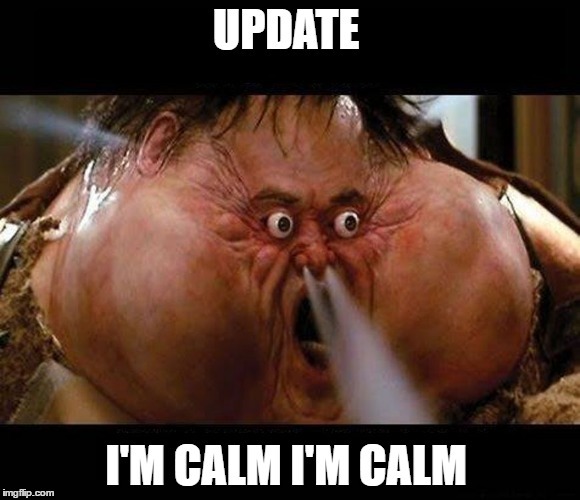 Finally I must point out that we are still in the early stages of creating a vaccine, but if anyone out there would like to take part in our trials please do not hesitate to contact the branch. 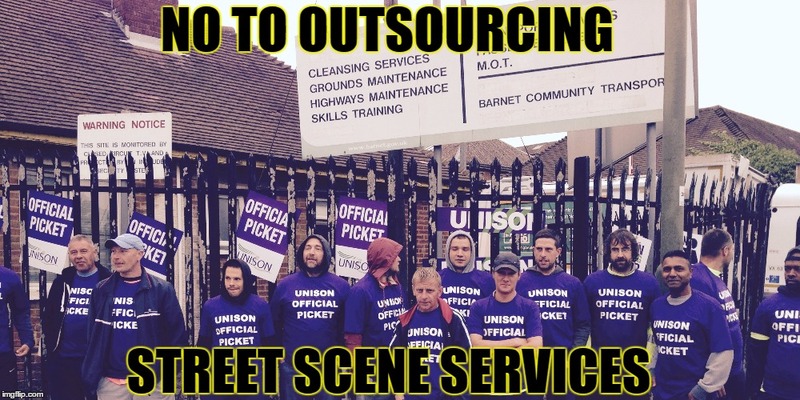 Solidarity.” John Burgess, Branch Secretary, Barnet UNISON. On Wednesday 15 March 2017, Barnet Council met to consider whether to outsource In-House Street Scene Services. For the sake of transparency we have recorded this meeting in order our members can hear what was said about the service. The next Environment Committee is on 11 May 2017.